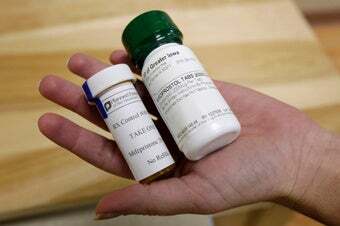 Might be an unhappy new year for the poor and geographically disadvantaged abortion-seeking women of Iowa: a program that's helped thousands to receive the abortion pill RU-486 over the Internet might be eliminated, if incoming antiabortion legislators get their way. In case you haven't stayed current on the latest abortion technologies, telemedicine abortions enable women to Internet-videoconference with a doctor, who can make RU-486 (mifepristone) available to them via remote control. As the Washington Post reports, Iowa's currently the only state offering these services, through a pilot program run by the state Planned Parenthood affiliate. So far, at least 2,000 women have taken advantage of the program. Meanwhile, legislators in Nebraska also want to ban telemedicine abortions, which aren't even available in their conservative state. Better safe than sorry, right? Nebraska state senator Tony Fulton has proposed a bill that would require doctors to be physically present when administering RU-486—which would remedy nothing but make it harder for women who have to travel hundreds of miles to the nearest abortion provider. For extra effect, Fulton's given telemedicine abortions the ominous-and-toxic-sounding name "chemical abortions." You can expect other states to provide such depressing reports in the months ahead, thanks to all the conservative governors and legislative majorities who won office during the November mid-terms. This, combined with efforts to restrict late-term abortions, suggests one helluva long, frustrating road ahead for pro-choice advocates.